Ma Ingalls washed on Monday. She ironed on Tuesday. And mended on Wednesday. Because of one of the most beautiful inventions of all time, the washing machine (thank you, Lord Jesus! ), we don’t need to spend three days doing this – we can compress all these activities into one day. I’ve tried all sorts of different ways to stay on top of the laundry around this joint – I’m sure you have too. Laundry seems to sneak up from behind us and pounce when we’re not looking. In our FREE Laundry Guide we give you three different options for staying on top of your laundry, along with some nifty tips. What I have found that works best for our family of 6 is to have one major day that I spend on laundry. Notice that word “major” up there? Let me explain. piles of laundry STRESS ME OUT. I do not like seeing pictures of people online showing their Mountain O’Laundry. It makes me break out in hives and I feel like I might hyperventilate. Sad…but true. Because I don’t want laundry to pile up that way, I do at least one load of laundry EVERY DAY. I start one right before I go to bed, so in the morning it is either ready to go into the dryer or out on the clothesline. In the book Large Family Logistics, their rule is 4 by 4: 4 loads of laundry done by 4pm. They have eight children, so they are working with a bit more laundry. So, my rule is 1 by 1. While washing laundry that day, I’m also working on other things. Sewing on buttons is not my favorite task, but sometimes it has to be done. Mend on Monday if you can. Or if you can’t…spend Monday finding someone to mend for you. Ha! I have to iron dress clothes for Barry each week because he works a white-collar job. Also, I iron things that might be weird – like collars on kids’ shirts. Keep in mind ironing for the next Sunday and hanging said outfits in the closet. A nicely ironed dress for church makes everyone there think you got it going on. Ha ha! Is there an outfit in your closet you never wear because it needs ironing? Iron it on Monday. The end. On Laundry Day I also prep our clothes for the rest of the week. I take a look at the calendar and plan accordingly. Then, I choose our clothes and hang them in the closet, in order by day. In the mornings, it’s easy to grab and get ready instead of standing there pondering what to wear. I also do a version of this method using File Crates for the kids. They can’t come to me and say, “Moooooooom, what do I wear today? !” They know. If you’d like to see our File Crate Dressing System, check it out HERE. And that’s what laundry day looks like around here – how you could modify this to suit your needs? I tried to open the laundry guide but it won’t open. Help! Hi Stacy – I love to hang things on the line – but really don’t like the “crispy” feeling it gives the items. Any suggestions? I’ll try that – thanks, Stacy!!! I LOVE YOUR BLOG, COLUMN, WHATEVER YOU CALL IT! THANK YOU FOR TAKING THE TIME TO SHARE!!! You can call it whatever you want. Ha ha ! :-) Thank you! After clothes are washed and dried, they are immediately put in the closet or in drawers. Annie does her own, but I do everyone else’s currently. I hang clothes in my closets so that the cleanest things are put to the left and the unworn things are on the right. That gives me a good clothing rotation and I can see which things I’m continually skipping over – usually an indicator that I can donate those. In the drawer, clean things go in the back and unworn items are in the front. It rotates things – hey, I used to work at a grocery story, so it’s in my blood. Ha! We store seasonal clothing in tubs in our attic so the only thing out is the current season. It saves a lot of closet space. Yes! When I get away from this schedule, I run into the same problem. I am loving this series! We are pretty much kindred spirits when it comes to homemaking:). 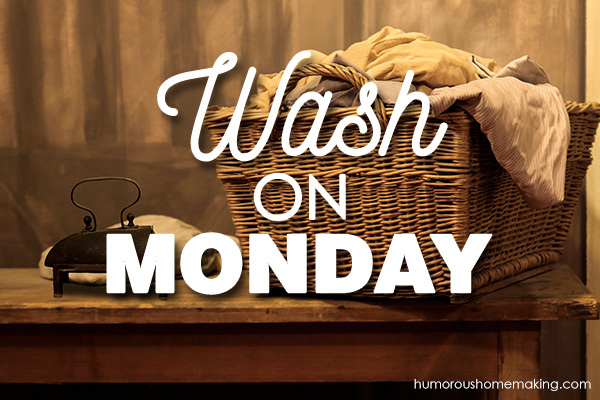 I always wash on Monday’s, but I also always hang it out, so it depends on the weather, and in the winter wash day spills into 2 days, because I bring in the clothes and put them on a rack to finish drying. By the time its dry, folded, and put away, its time to wash again. But laundry really is one of my favorite chores. I’m reading large family logistics for probably the 3rd time! It’s seriously the best book on home management ever! Isn’t it? 🙂 On wash day, I don’t line dry anything except one load. All my others are in the dryer. However, during my weekly “one load per day,” those go on the line. There is something SO satisfying about hanging laundry out to dry. I used to hang my laundry. I miss it. This house just doesn’t have an area for it. But those were the days! There are only two of us–finally, thank God, so we can manage all in one day except for towels, which get washed twice a week. I have come to actually enjoy ironing–believe it or not–primarily because it’s one of the rare times I can catch a TV show! Yep sheets, bathroom & kitchen linen are all done on a Monday and a load each night to be hung out in the morning. A tip I have is keep a recycled coffee jar of buttons and a spool of neutral (grey) thread with needle in your laundry cupboard/on shelf so if you see something missing a button (usually school skirts/trousers or work pants), just quickly sew one back on…. I’m lucky that the kids are at a private school – compulsory formal uniform and hubby & eldest son wear the same brand of work wear – all navy blue with navy blue buttons – too easy (not great planning just great coincidence). As the work wear becomes un-wearable I take off the buttons to put in the jar and zips to go into my sewing stash, then I cut up the material for use as oil rags in the workshop. Thanks for all your tips Stacey. Like the idea of putting all the clothes in order for the week. I have been trying to adopt this system for a while but I always seem to get distracted and forget my loads in the wash. Then Monday laundry bleeds over into Tuesday, oops! I’m working on it though ? For the past 30+ years I have done laundry five days a week, but I only do 2 loads a day. It is faster for me to do the loads, dry, iron (if necessary), and put away the same day. But I do laundry according to the rooms I am cleaning. If there isn’t a full load of laundry (Guest Bath/Den day) I will wash clothing. This means that the monthly wash gets done in a timely fashion, as well as the seasonal wash (curtains, furniture covers). The reason I started doing it this way was because I had a full-time job and I wanted my weekends free to enjoy my family. Nola, your system sounds like it’s working great for you! 🙂 I’m so glad! 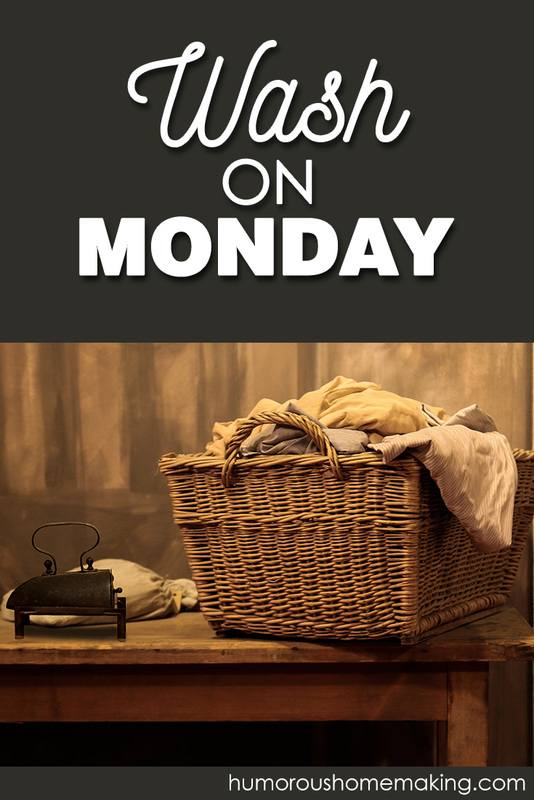 I try to do Mondays as Bedding and Bathroom laundry day. I usually, like today, have a load of kitchen laundry ready too. today is the first Monday of the month so I wash the pillows as well. I have adopted this style too. I think cuz I change the sheets on Monday so …hey…keep it going with towels etc. I try and iron as I go and sometimes…if I get really industriaous I iron damp clothes from the washer…oh the thrill! If you ever read my book Stacy, you’ll see my laundry day was even mentioned in Tim’s eulogy. As I felt I could have a nervous breakdown after laundry was done the following Monday of the funeral. (Yes..I am pragmatic). Well…gotta go…I have clothes calling from the dryer. They don’t call me the Laundry Queen for nothing. (I once was dethroned when I put a gold shirt in a white load. My bras looked like the negative of a fried egg….meaning the cup was white but everything else was gold?. But they soon put me back on when they realized they didn’t want to do it). My daughter now takes her laundry in. I think I spoiled her on this one. You iron?! I always love to meet a fellow kindred ironing spirit! Solidarity! And I always knew I liked you!